Ewe Gotta Knit: Not sure what day of the week it is? Not sure what day of the week it is? Well, it must be "Several Post Saturday" ... seems like the only time I get a chance to blog is Saturdays when T is at work (if he's home, we are usually out and about - doing chores or on an adventure). This is my third post of the day, so it must be Saturday! 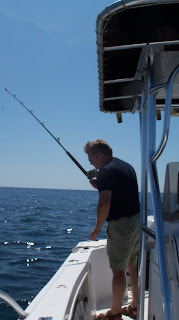 Last Saturday, we went fishing in the ocean, and then overnight to Coffin's Island. We took Brucie and Duffy but I didn't get any pictures other than of T fishing. These are my Vanilla Camo socks, made of Patons Kroy FX yarn, in the Camo Colours colourway, with Kroy in Flax for the heels, toes and cuffs. As usual, knit on 2.75 mm needles and my usual pattern for vanilla socks. I tried to get them knit from a single ball of the Camo colour, but ran out with about an inch to go in the toe (a common occurrence lately). They are about a size 6 - 7 ladies, and I am not sure who they will be for, but they will go in the Christmas pile,as most of the women in the family and my friends seem to have a size 6 or 7 foot. 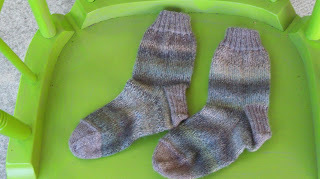 I love the colours in these socks, and think the Flax matches quite well. I am certain, though, that it is impossible to get a matching pair out of any of the FX colours ... it looks like they are put together in a random way. I also have been knitting some for the craft sale in September (not much yet though, and I have to get my arse in gear ... will my wrists forgive me?). 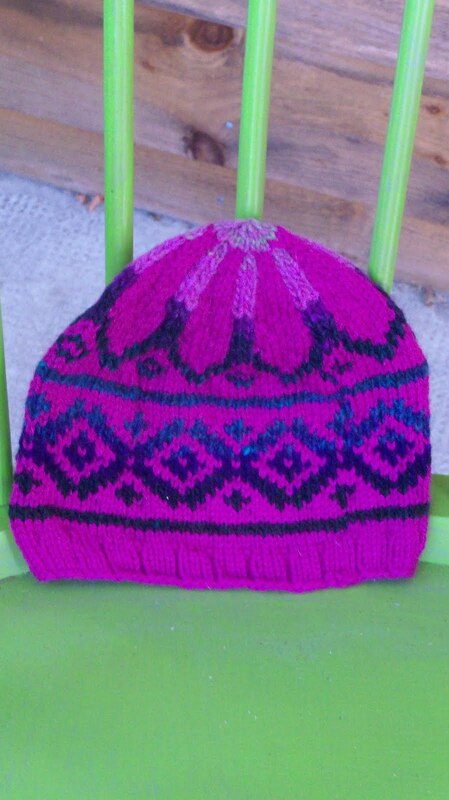 I made another of the False Fair Isle hats by Amy King, this time in Patons Classic Wool (Orchid)for the main colour and using scraps of Noro colour 90 for the patterned bits. This hat is also in size small, and should fit a child up to about ages 9. No cute model this time (my niece was on a trip when this was taken). Shoot - I just noticed that the picture has my "starting point' in it, and I didn't use a jogless join ... ah well, it is pretty! You'd need more than two skeins of FX if you wanted to match those up, they are impossible otherwise. My normally - gotta match or else - is out the window when I knit with FX! You have been a busy little beaver getting all these projects off your todo list. They look great! Love the hat! Running out before the toe is my worst nightmare (well, maybe not my worst nightmare, but it's on the list.) I always do toe up socks as a result. I've even learned a nifty way to do a sock with a heel flap from the toe up. Love the hat... but are you just teasing us with photos of your rocking chair?